Little Evie, as she is now called (she was a ?Gertie? !! ), came to us from a kennels recently. She is a small brindle girl ? medium brown with black stripes ? a ?tiger-dog? as someone said. She was not used to indoor living and scared even to step on floor tiles at first. Now she is beginning to get bolder, finding her way round the house, and outside, though she is quite afraid of other dogs at present. 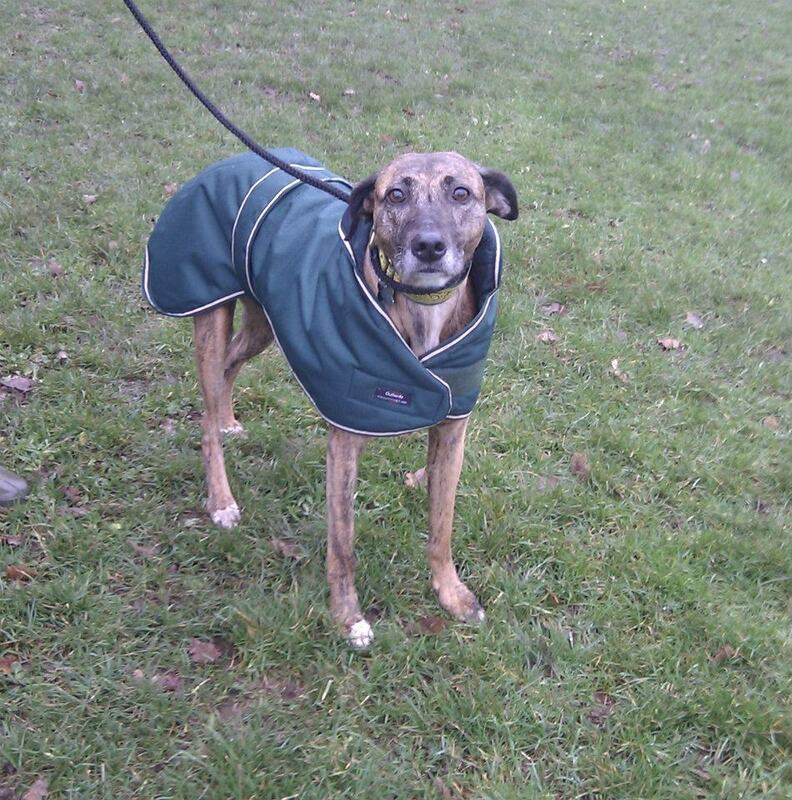 Evie is a lurcher and unlike many greyhounds, has quite a voice on her. She gets very excited at W.A.L.K. time, and lets out a growl of pleasure which is a bit scary to hear! She has enjoyed basking in the sun, though she might not get the chance to do that again for a while. Apart from a few fierce tugs when she has spotted a rabbit or a local cat, Evie is a delight on the lead, very well behaved, and happy to go as fast or as slow as her humans indicate. She has, we think. enjoyed having her coat on for outings in the recent cold weather. She has discovered the joys of a squeaky toy rugby ball. Lastly for now, we are finding that Evie does not mind the rain too much ? she probably minds it less than we do! ? though the clock change has been a bit confusing now it gets dark for the evening walk. She can?t understand why ?tea-time? has been put back either, so we are changing feeding times gradually. We hope you can meet Evie at one of the DAWG events in the near future! Julie & John.